A recipe from my cookbook Too Good To Passover: Sephardic & Judeo-Arabic Menus and Memories from Africa, Asia and Europe, Section 1: Africa, Chapter 5. This Moroccan haroset is shaped into a small ball, then rolled in ground cinnamon to resemble an elegant truffle. For the most impressive way to serve visually, stack balls on top of one another into a pyramid shape on an elegant platter alongside any other more classic haroset spread in a bowl. When it comes time to eat, guests may help themselves to a single truffle and eat it straight, or pressed down between two small pieces of matzah as a sandwich. 2. Add the dates and raisins and combine in the food processor for about 30 seconds. 3. Add the wine and pulse until the mixture becomes a soft paste. 4. Taking one level tablespoon (or mini melon ball scoop) at a time, roll the thick paste into 1-inch balls* (if the paste is sticking too much to your hands, try dipping your hands in cold water and then rolling them). 6. Serve haroset balls at room temperature stacked in a small decorative bowl or on a small platter alongside tea matzahs. Store balls in a tightly covered plastic container between layers of parchment or wax paper in the refrigerator for up to three days, or the freezer for up to one month. *Note: If you wish to serve the mixture in the more common way of a paste in a bowl, then add a little more wine or warm water to make a bit smoother and softer for spreading. Nargesi: A pie in love with itself. 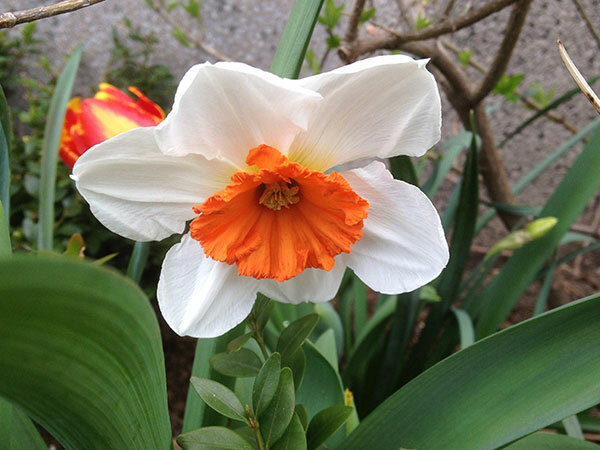 The name Nargesi comes from the Farsi word (Narges) for the Narcissus plant or daffodil, a sunny springtime flower (with either bright yellow petals and a deep orange center, or bright white petals with a deep yellow center) that has come to symbolize rebirth and renewal. This river bank flower is named after the Greek God Narcissus known for his extraordinary beauty, who subsequently drowned while admiring his reflection in a pool of water. Over time the term “narcissist” has come to define someone consumed with his or her own physical appearance or ego. In my research on this dish I came across photos where instead of the eggs being scrambled with greens and herbs (as done in this recipe), the eggs were cracked open and poached directly on top of a bed of sauteed greens and onions, which visually resembles the Narges flower over leaves. 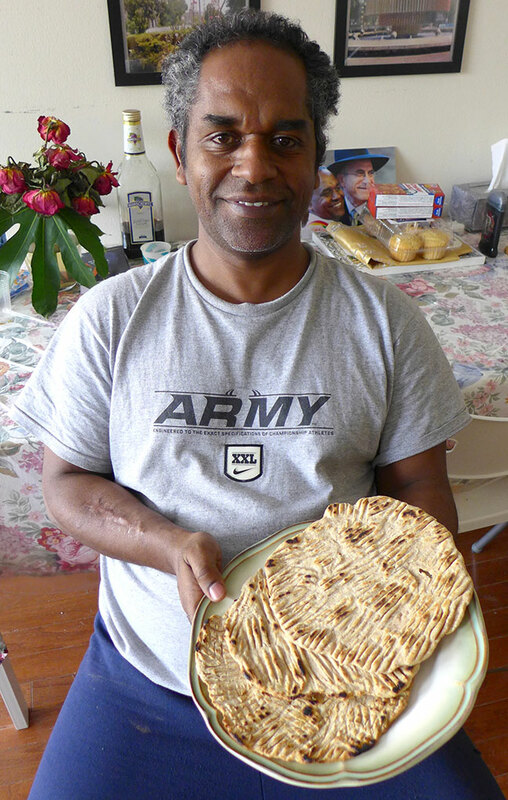 I learned this unusual recipe from my friend Simona Shokrian, whose family would serve this for Passover. The resulting dish is more like a hearty frittata, mixed with herbs, spinach, and tiny meatballs, that you cut into wedges like a pie. Naima Abrishami suggests to sprinkle with lemou Omani (crushed Persian dried limes) to add a slight tangy flavor before serving. 1. Drain the excess liquid from the puréed onions and mix with the ground meat in a medium bowl. 2. Heat a large 5- or 6- quart pot with oil over high heat for 1 minute. (Note: Your pot should be about 9 or 10 inches wide, but no more or the final pie will be too thin!) Add the chopped onions and cook until soft and transparent, about 5 minutes. 3. Add the salt, pepper, turmeric, and cumin (if desired) and mix well. Cook 1 minute. 4. Reduce to a medium-low heat. Wet your hands lightly with cold water (to prevent sticking) and taking only 11/2 teaspoons of the meat mixture, form it into a small, smooth meatball the size of a large cherry. (Meat will be very soft and wet, so be gentle.) Drop the meatball into the pot and continue until all of the meat mixture has been used up. Cover pot and steam until solid and cooked through, about 20 minutes. 5. Drop in the parsley, coriander (or tarragon), dill, spinach, and leeks (or chives) and cover. Steam until the herbs and spinach have wilted and softened, 10 minutes. 7. Once nargasi has cooled, re-warm over medium-low heat for 2 minutes. Gradually pour in the beaten eggs while gently mixing with a spoon to distribute evenly. Partially cover and steam over lowest setting until eggs have solidified but are still soft and slightly wet in the center, 35 to 40 minutes. 8. Score and scoop out large pieces of the nargasi and arrange in layers onto a serving platter or plate. Serve warm with lemou Omani on the side for individuals to sprinkle on top of each serving, as desired. Charazoti: Georgian Flavors Come Through in their Charoset. A version of this charoset was described to me by Irina Kazhiloti. The walnuts, which are commonly found in Georgian cooking, are added in a larger quantity than the rest of the nuts, while the addition of pears and peeled chestnuts give it a thick texture similar to a pâté. 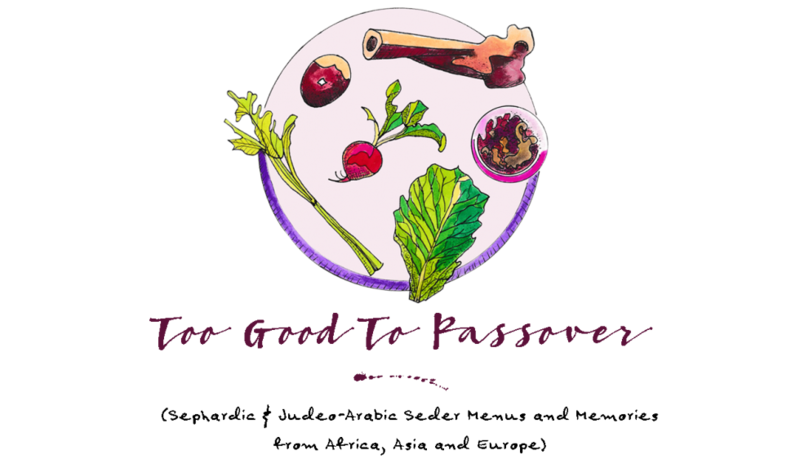 Try serving this with one or two other charosets at your Seder table this year! and orange juice and pulse until mixture becomes smooth and thick, almost like a pâté. 3. Place into an air-tight container and chill for 2 hours. Serve in one or two small decorative bowls garnished with chopped nuts. Charazoti may be store in the refrigerator for up to 3 days. Revisiting the Egyptian Sofrito: Test 3 is the charm. I had neither tasted nor even heard of a sofrito until one year while visiting family in France, my husband and I were invited to the home of Dinah Franco — a Sephardic Jew of Egyptian descent. Sofreír in Spanish means to sauté or “lightly fry,” and in Spanish, Portuguese, Caribbean and Latin American countries, a sofrito is a type of sauce made by cooking a lot of garlic, onions, and spices with various vegetables for a long period of time over low heat, so that it can be used as a base for cooking meat, other vegetables, beans or rice dishes. The following recipe is one that I recreated after having tasted Dinah’s, which combines nutmeg, ginger, cloves, and turmeric, with a lot of garlic and onions. When I was first developing this dish I focused on getting the right balance of seasonings and ingredients down on paper, and when I later tested my recipe I found that the result was more like a soup than a stew. In this most recent third attempt I used a lot less liquid to braise the meat and cooked it over a lower heat for a longer period of time. The overall result was a thick, rich sauce that took on the flavor of the meat, and more of what a true sofrito should be. STEP 1: Gather and prep your ingredients (3 pounds beef stew pieces, 4 cups onions, parsley, 1 to 2 cups coriander leaves and/or parsley leaves, 4 to 5 tablespoons garlic, spices, 1 to 1 1/2 teaspoons kosher salt, black pepper). THE SPICES: 1/4 teaspoon cloves, 1 teaspoon ginger, 2 teaspoons turmeric, and 1/2 teaspoon nutmeg. STEP 2: Brown the meat in a large heavy-bottomed pot with a little oil over high heat, then pour into a separate bowl along with all of its liquid. STEP 3: Add a few tablespoons of oil to the same pot (no need to wash) and cook onions over medium-high heat until soft and transparent, but not browned. Add the garlic and while stirring, cook for 30 seconds. STEP 4: Add the spices, salt, and pepper, mix, and cook over medium heat for about 1 minute. STEP 6: Dinner is served. Each spring, Ginette Cohen would pack her suitcase with quatre épices and a box of Spigol spice packets, and fly from France to New York City to visit her grandson David Rak for his birthday. In his tiny Harlem kitchen, she would prepare the dish that he most longed for: Les Boulettes, and a few weeks ago I was lucky enough to catch her on a visit and learn her secrets. 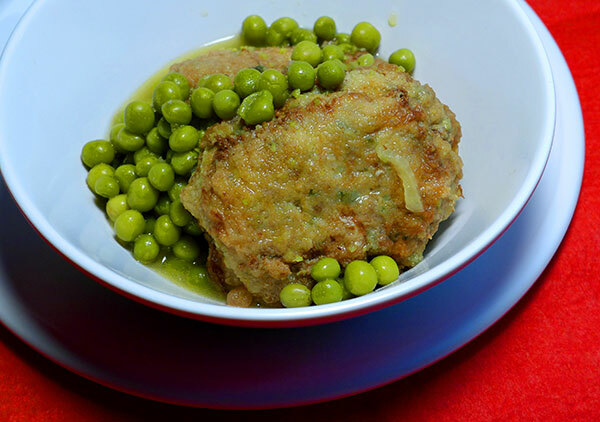 Ginette explained to me that for other occasions, these meat patties would be coated in semolina and served over couscous, but during Passover they were instead dusted with matzah meal and served over steamed crushed matzah. Proudly served on all occasions, Boulettes gives delicious new meaning to Algerian-Jewish comfort food. 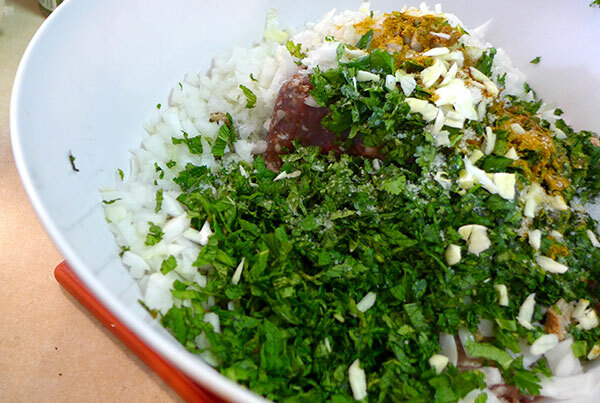 Step 1: Combine ground lamb and beef, eggs, broken up matzah, almond flour, onions, garlic salt, pepper, nutmeg, allspice, cloves, cinnamon, cumin, turmeric, saffron, mint, coriander, and parsley in a large bowl. 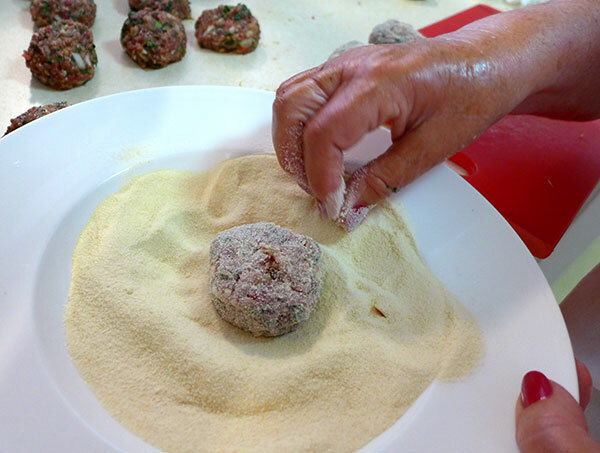 Step 2: Roll meat into large balls and roll lightly in the semolina or matzah meal. 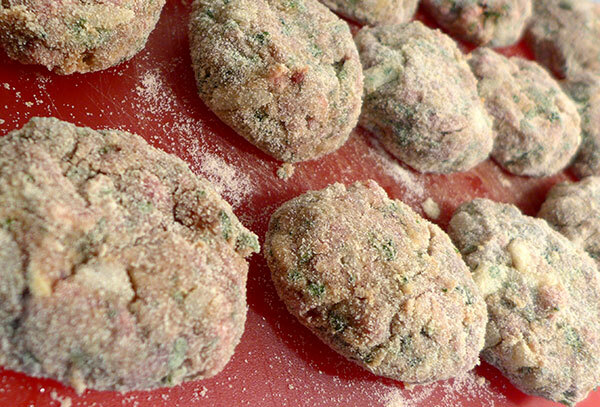 Step 3: Place all coated meatballs onto a cutting board or tray and flatten slightly into patties. Step 4: Coat patties into beaten eggs. 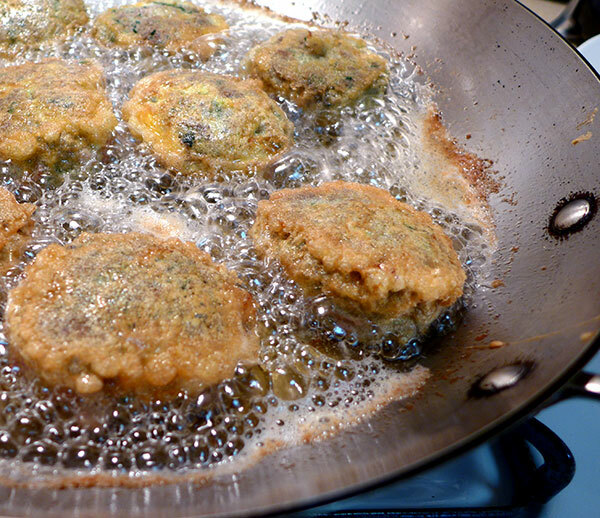 Step 5: Gently place into a pan with very hot oil and fry until dark golden-brown on both sides. Step 6: Simmer boulettes with peas in a broth made of water, onions, salt, turmeric, and saffron for 1 hour.